Indian startup CEO wants to change short messaging with an almost free service. How many times have you asked someone to give you a missed call to inform that the person is ready or needs to be called back? If Mrinal Desai has his way, you should now be able to convey the message better, but with just one tap. With the addition of the tapp feature in the latest update of his addappt contacts app, Desai hopes he will be able to change short messaging for ever. “It is a new short form communication mechanism using notifications. One can send 100 customizable characters and/or emoji with a single tap,” says the CEO and co-founder of the Bay Area-based company. Another interesting feature of tapp is that it is completely private with no history of the conversations and nothing saved on the device or the server. “We believe this will be perfect for India where often a sequence of missed calls is used as a pre-agreed communication,” he says, adding that now this can each be a ‘notification on tapp’. CEO and co-founder Mrinal Desai. The new tapp feature in addappt lets you edit, delete or add new notification. You can also add emojis with a single tap. There is also a group tapp feature which lets you broadcast a message to an unlimited number of people. Desai says the group tapp feature, which will be restricted to the iOS version, will be a big help for schools to inform parents, wedding organisers to ping guests and so on. But we know it could be of better use during Holi and Diwali for a emoji-filled greeting. One thing that will appeal to Indian users is the fact that tapp is almost free. “It is better to under promise, but I would say we can fit at least a thousand tapp notifications per MB. So based on the calculations I used, again approximately, we are talking about roughly 1000 notifications for 22 paise/ month and 66 paise/month for the heaviest user (who would have a cheaper data plan presumably) with 3000 notifications,” says Desai after a bit of number crunching with his engineers. The new version of addappt will roll out for iOS and Android users today and will be available across the world in 11 languages. 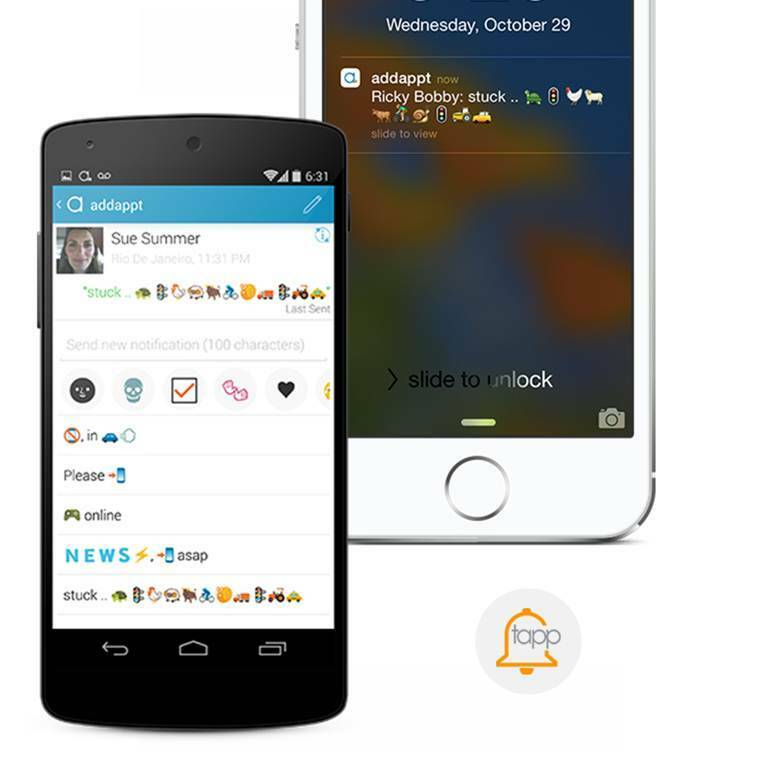 addappt is Desai’s second startup after being LinkedIn’s first business development manager. He calls the app a free ‘live’ address book on the iPhone and Android that updates when your friends change their contact information, privately. “My Co-founder, Jorge Ferreira, is a Microsoft veteran and a graduate of the premier University of Washington’s Computer Science department. Last he was a Team Lead for Sharepoint. We were also fortunate to bring in another Microsoft veteran Carlos Brito as a part of the founding team to be our Principal Developer,” he adds. “The fundamental notion of addappt comes from our core belief that the original social network was the address book… the physical notebook on which people wrote address and phone numbers down. Technology has had many advances but the address book is yet to change – we want it to ‘adapt’ .. we want it to ‘adapt’ with the times and technology but we also want it to ‘adapt with your friends’ when they change their contact information,” he says, adding that the app will be free, though there will be premium services in the future. Desai’s dad was a banker and he grew up in Kolkata where we went to school at La Martiniere. He did his engineering from Birla Institute of Technology in Mesra, Ranchi, but could not pursue his masters in the US as his student visa got rejected twice. “I stayed back and joined Tata Elxsi in Pune in business development where I managed their latest Asia Pacific account for Silicon Graphics products. Then I tried again for the US in 1999 and came to Monterey, CA for my MBA in 1999 – a boom time in tech in the US.” But by the time he graduated in 2001, the dot com bubble had burst and Desai found himself unemployed. “For three long years I kept questioning my decision to leave everything behind and come to the US. But it was the unemployment, that helped me discover LinkedIn in 2003 and when it had only 40,000 users.” In 2004, he ended up being their first business development manager when they had 15 employees. No wonder Desai is good with contacts.